CNN's Terry Baddoo believes the Klitschko brothers are the biggest attraction in boxing. To be the best you’ve got to beat the best, so the saying goes. But in professional boxing it seems to be the best you’ve only got to avoid the best. There is no doubt that the Klitschko brothers are two of the biggest attractions in boxing right now. 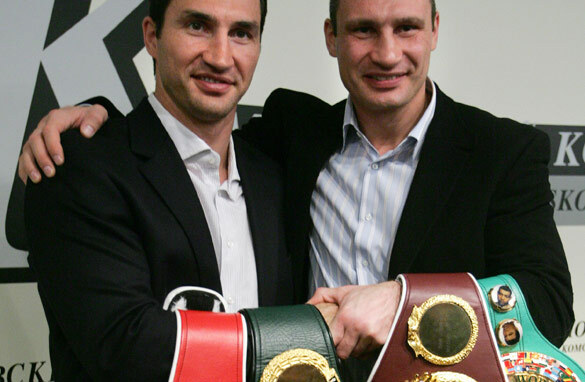 Wladimir holds the IBF and WBO heavyweight crowns, while Vitali is the WBC belt holder. Each lays claim to being the world’s best heavyweight, though they will never fight each other to answer the question once and for all. That’s understandable, as fighting is obviously a hurting game and the fight would be a sham, because who wants to hurt their own flesh and blood? But while a sibling battle is unimaginable, a fight with WBA champion, David Haye, was a no-brainer for this year and the only fight for either Klitschko that would validate their position and their legacy. Unfortunately, it seems that will not happen, as Vitali will instead meet Odlanier Solis in March, and Wladimir will fight Dereck Chisora on April 30th, with one or other of the Klitschko’s now set to fight Tomasz Adamek of Poland in September depending on the outcome of the previous fights. That leaves Haye out in the cold. And, as he plans to retire from boxing in October, it could mean we never see the explosive Brit tackle the Ukrainians or see the heavyweight titles unified any time soon. To my mind that would be a massive shame. Let’s face it, boxing has been largely out of the public consciousness for some time now. Yes, we’ve latched on to Manny Pacquiao as a personality, but I still believe that boxing is only as popular to the masses as its heavyweight champion because the notion of a fighter who can conquer all as opposed to all in his weight class is a lot more tangible. Yet the opportunity to produce a top dog is repeatedly scorned for reasons of money, politics and ego, while ignoring the demands of the public, or at least those who really care about the sport. For my sins, I still like boxing. I’m old enough to remember the buzz around Ali-Frazier, Ali-Foreman fights. The Bowe, Holyfield, Tyson era. And even during the times when the focus fell away from the heavyweight division, the Hearns, Leonard, Hagler, Duran dynasty filled the gaps with equal aplomb. Had Twitter been around back then, boxing would surely have been among the top trending topics. It was a conversation you had. Sadly, you can’t say that about any boxing match in the 21st century. Most people just don’t care, with the result that the sport dies a little more every day. Haye versus the Klitschko’s would not have been a cure all, but they are fights that people would have wanted to see. Unfortunately, it seems they are off the agenda, which is great for fans of Solis, Chisora, and Adamek, but nobody else. Hi there. This one goes outside the topic but I've been waiting for CNN World Sport all day long on TV and when it finally would be aired with all the latest in AUS Open, there is no show...again. I undestand some major World News sometimes go before World Sport, but I think it's too much, when you all the day focus on Egypt and then leave World Sport out of the schedule. It's not only today, this happens too often. World Sport should be aired on its time if nothing really outstanding has happened in the World. I mean soon you can argue almost every event in the World is more than important than CNN World Sport. We need Sports and entertainment to stay alive. We need World Sport on CNN. Thank you. Hopefully you, Terry Baddoo, will give this information further to big decision makers on CNN. Hasn't Haye backed out of two contracts to fight the brothers? Why didn't you mention that in your article? Ah..now I know they are brothers. They really look a lot. lol. Whats great about them was that they both agreed about the kind of career they choose. And they both excel in it. Good job guys.